Description This chapter reviews the dermoscopyThe examination of [skin lesions] with a 'dermatoscope'. This traditionally consists of a magnifier (typically x10), a non-polarised light source, a transparent plate and a liquid medium between the instrument and the skin, and allows inspection of skin lesions unobstructed by skin surface reflections. Modern dermatoscopes dispense with the use of liquid medium and instead use polarised light to cancel out skin surface reflections. criteriameasure of how well one variable or set of variables predicts an outcome of nodular melanomaThis glossary term has not yet been described. Melanoma, Nodular, Nodular melanoma Nodular Melanoma – cite! Nodular Melanoma (message) Nodular Melanoma – participate! 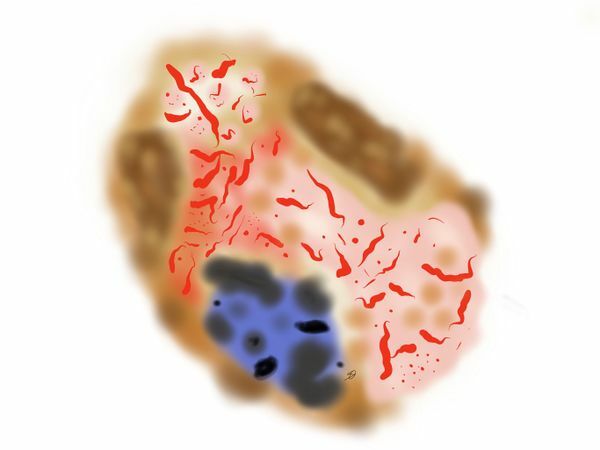 Nodular melanomas (NMs) are defined as invasive melanomas without a radial growth phase. Specifically, they lack an in situnot seen to be spreading from a localized position component beyond three rete ridgesEpidermal extensions that project into the underlying dermis of the invasive vertical growth phase. While they represent only 14% of invasive melanomas, whereas they represent the majority of thick melanomas (>3 mm Breslow thickness). Clinically, NMs may lack the “ABCDThis glossary term has not yet been described.” features more typical of superficialThis glossary term has not yet been described. spreadingThis glossary term has not yet been described. melanomas (SSMs) since they appear as a symmetric lesion. The classic melanomaThis glossary term has not yet been described. specific criteria are predominantly seen in SSMs but much less frequently in NMs. Especially the features correlating with the radial growth of melanoma and pagetoid spread (pseudopodsBulbous and often kinked projections seen at the lesion edge, either directly associated with a network or solid tumor border., radial streamingRadial linear extensions at the lesion edge) as well as those criteria found in thin melanoma (such as atypical broadened networkThis glossary term has not yet been described. and the early regression feature of multiple blue-gray fine dots or pepperingGray dots) are often lacking in NMs. multiple (5–6) colorsThis glossary term has not yet been described. atypical vascular patternsThis glossary term has not yet been described. Melanomas tend to have an asymmetric pigmentation pattern under dermoscopy. While most NM are asymmetric, 6% have a symmetric pattern  . Nevertheless, the majority of pigmented NMs can be diagnosed using standard dermoscopy criteria. What is diagnostically problematic is the fact that a significant number (more than a third) of NMs are hypomelanotic or amelanotic. In these cases, atypical vascular patterns may be the only cluesEvidence, in an investigation for the diagnosisis the identification of the nature and cause of a certain phenomenon. Diagnosis is used in many different disciplines with variations in the use of logic, analytics, and experience to determine "cause and effect". In systems engineering and computer science, it is typically used to determine the causes of symptoms, mitigations, and solutions of such lesions . The most significant of these patterns are the combination of linear irregularlinear vessels with multiple bends and dotted vesselstiny pinpoint vessels or linear irregular vesselsThis glossary term has not yet been described. as the predominant vessel type, greater than one shade of pink, milky red-pink areas and or globules, and hairpin vessels. ↑ 1.0 1.1 1.2 Menzies et al. : Dermoscopic evaluation of nodular melanoma. JAMA Dermatol 2013;149:699-709. PMID: 23553375. DOI. ↑ Pizzichetta et al. 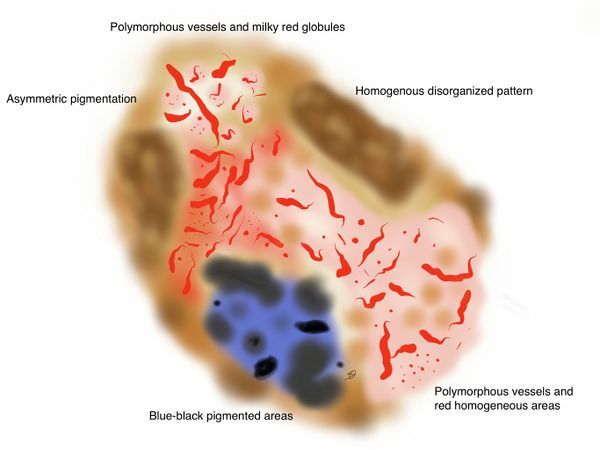 : Pigmented nodular melanoma: the predictive value of dermoscopic features using multivariate analysis. Br. J. Dermatol. 2015;173:106-14. PMID: 25916655. DOI.